If you were to walk into my closet (which is recently color coordinated) the biggest section are the grays and pinks. I’ve been advised by my friends to stop shopping for these, but honestly I am a sucker for gray tees. They are so versatile, and real talk – gray is a color that looks good on all skins tones. This easy-look has been on repeat, especially for a casual work day or a day filled to see clients. This outfit has a couple of MY latest obsessions. Starting with these fab shoes from Sam Edelman. As you all know, the UH-MAZING Rock Stud Valentinos are every girls dream shoe, ever since they came out, but aren’t we thankful for Valentino-inspired GREAT deals like these Sam Edelman? I’ve seen a lot of other Valentino-inspirations that have bugged me, simply because they look and feel uncomfortable, plus the material is cheap. One thing is for sure, these cuties are one heck of a shoe. SO comfortable, you won’t want to take them off. Total steal ladies! Also, a few months back I blogged about Dylan lex necklaces, they are to-die-for. However, once again, Urban Philosophy has them for a fraction of the price. 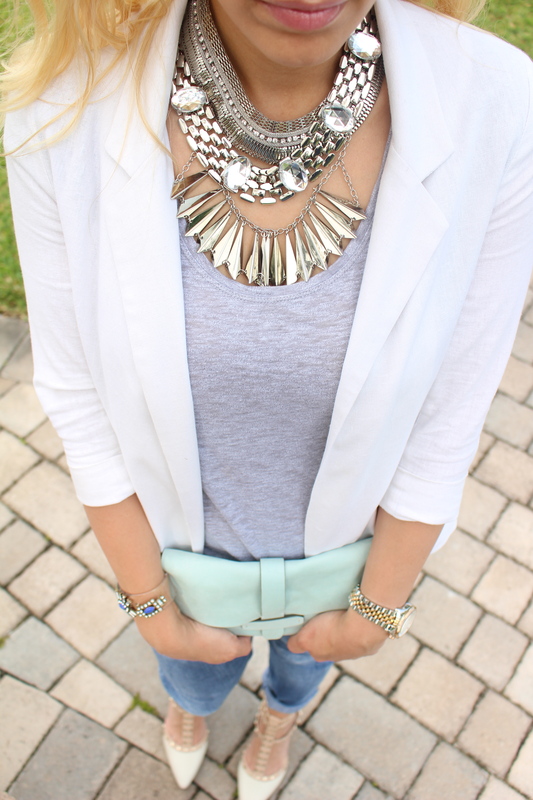 It is all about layering ladies! Layer and create your own look!